The 2014 Laurel Highlands Ultra: a 70.2-mile footrace (and 70.2-mile relay, 50K, and 50K relay) on the Laurel Highlands Hiking Trail from Ohiopyle, PA to Seward, PA, on June 14, 2014. I'd rather have been running, but... I tried to get as many runners as I could (very sorry if I missed you), and also some of the great volunteers and the beautiful atmosphere of this event. Feel free to download any of these images for your personal use (just right-click on the image and select "save image as...") You can also purchase higher resolution images or order prints through this site if you'd like (proceeds go towards better equipment for better photos the next time I'm on the injured reserve). Near CP1 (Rt. 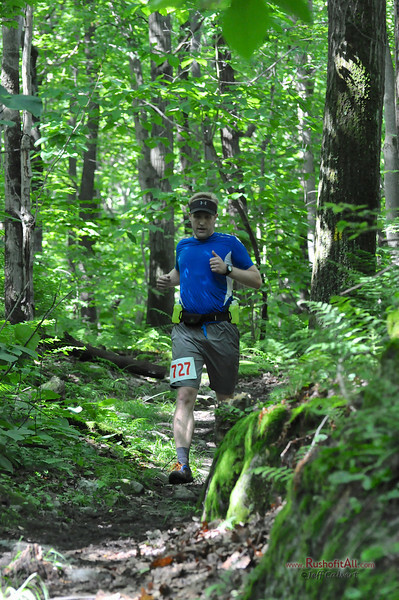 653) during the Laurel Highlands Ultra: a 70.2-mile footrace (and 70.2-mile relay, 50K, and 50K relay) on the Laurel Highlands Hiking Trail from Ohiopyle, PA to Seward, PA, on June 14, 2014.